An employee stock ownership plan (ESOP) is an employee-owner program that provides a company's workforce with an ownership interest in the company. In an ESOP, companies provide their employees with stock ownership, often at no up-front cost to the employees. ESOP shares, however, are part of employees' remuneration for work performed. Shares are allocated to employees and may be held in an ESOP trust until the employee retires or leaves the company. The shares are then sold.Some corporations are majority employee-owned; the term employee-owned corporation often refers to such companies. Such organizations are similar to worker cooperatives, but unlike cooperatives, control of the company's capital is not necessarily evenly distributed. 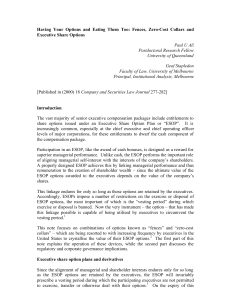 Compared with cooperatives, ESOP-centered corporations allow for company executives to have greater flexibility in governing and managing the corporation. Most corporations, however, utilize stock ownership plans as a form of in-kind benefit, as a way to prevent hostile takeovers, or to maintain a specific corporate culture. These plans generally prevent average employees from holding too much of the company's stock.